Radical Muslims are lauding the election of Barack Hussein Obama. Siraj Wahhaj, an unindicted co conspirator in the 1993 WTC bombing case congratulated Obama writing that "We pray that Allah, Most High, will purify Obama's heart, [and] guide his actions and policies...Furthermore, we encourage American Muslims to engage in forging an agenda and shaping the future of our society." Al - Hajj Talib Abdur Rashid (the "resident Imam" of the Mosque of the Islamic Brotherhood whose slogan comes from Muslim Brotherhood leader Hassan Al Banna- see below) wrote that :"All Muslims must come to understand the unique, prophetic role that black people , and the Muslims from amongst them, are yet destined to play in the destiny of the land, and its people... to forge a DOMESTIC agenda based upon common interests , which will serve both the present and future generations." The Council on American Islamic Relations (CAIR) a Saudi funded front group for Hamas, which is an unindicted co-conspirator in the Holy Land Foundation Hamas funding trial, stated that "We look forward to having the opportunity to work with the Obama administration". The Islamic Society of North America (also an un indicted co-conspirator in the HLF Hamas funding trial) wrote on their website that:"We at ISNA offer our full support to Mr. Obama and to his administration, and we look forward to working with him in the future". http://www.nysun.com/article/55778?access=284047 Federal prosecutors have named three prominent Islamic organizations in America as participants in an alleged criminal conspiracy to support a Palestinian Arab terrorist group, Hamas. Prosecutors applied the label of "unindicted co-conspirator" to the Council on American-Islamic Relations, the Islamic Society of North America, and the North American Islamic Trust in connection with a trial planned in Texas next month for five officials of a defunct charity, the Holy Land Foundation for Relief and Development... A court filing by the government last week listed the three prominent groups among about 300 individuals or entities named as coconspirators. The document gave scant details, but prosecutors described CAIR as a present or past member of "the U.S. Muslim Brotherhood's Palestine Committee and/or its organizations." The government listed the Islamic Society of North America and the North American Islamic Trust as "entities who are and/or were members of the U.S. Muslim Brotherhood." MIM: A message from Siraj Wahhaj the Amir of MANA. 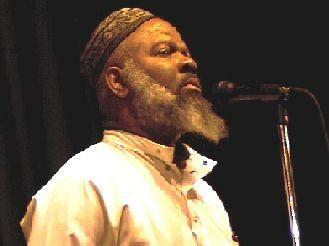 MIM: Background information on Siraj Wahhaj. An advisory board member of the Council on American-Islamic Relations (CAIR), Siraj Wahhaj was named by U.S. Attorney Mary Jo White as a possible co-conspirator to the 1993 bombing of the World Trade Center, and testified as a character witness for convicted terror mastermind Sheikh Omar Abdel Rahman. According to Salon.com, in a 1991 speech before the Islamic Association of North Texas, Wahhaj called Operation Desert Storm "one of the most diabolical plots ever in the annals of history," and predicted that America will fall unless it "accepts the Islamic agenda." He has openly expressed his desire to see the American government replaced with a caliphate. Wahhaj told a meeting of Muslim activists in Houston, "this government has already sent in every major [mosque], agent provocateurs. Most of you don't know what that is. All you know is about spies. The government has spies, they have infiltrators. But there's some difference from being a spy and an agent provocateur. What an agent provocateur does, he goes to a [mosque], he looks just like you. He's got a beard just like your beard... And their job is to entrap you no different than the prostitute, the police women dressed as a prostitute, whereas he's coming to the [mosque], dressed as a Muslim. And when they talk, their rhetoric, they are stronger than anyone else." "…And he [Allah] declared 'Whoever is at war with my friends, I declare war on them.' Who is a friend of Allah? [He chants a passage in Arabic] Allah. Your true friend is Allah, the messenger, and those who believe. Americans and Canadians. Hear it well. Hear what I'm telling you well. The Americans are not your friends, hear what I'm telling you, hear it well. The Canadians are not your friends, hear what I'm telling you, hear it well. The Europeans are not your friends. Your friend is Allah, the Messenger and those who believe. These people will never be satisfied with you until you follow their religion. They will never be satisfied with you…"
MIM: Wahhaj is the co founder and Amir of the Muslim Alliance of North America (MANA) which published Al- Hajj Talib Abdur Rashid's piece on their website. I live in Harlem, where people are shouting and dancing in the streets, with celebration on their lips and a renewed resolve to live and not just survive, in their hearts. It's almost midnight - an hour past the announcement of Obama winning the presidency, and people are still honking their car horns in the street. I live in New York City where people of various nationalities and across generations, party lines and religions have been buzzing with anticipation from brothas in the hood to Spanish-speaking cab-drivers. I live in a country and on a planet where people have been - hoping. To say the least,Obama has a job ahead of him of immense proportions. But so do we as Muslims in America. We MUST ORGANIZE ourselves into not only a moral, religious, and social force for good in America, but into a political and economic force as well. Our indigenous scholars MUST resolve the issues of fiqh that have African American Muslims still saying in the 21st century that Muslims should not participate in an electoral process that affects the daily fabric of their lives as Muslims, and as people of color. We MUST engage in the on-the-ground work that will strengthen our base as a righteous political force that "...enjoins the good and forbids the wrong". ALL Muslims MUST come to understand the unique, prophetic role that black people , and the Muslims from amongst them, are yet destined to play in the destiny of the land, and its people. All Muslims, taking that role into consideration, MUST find a way to create a table to which they can all come (as our brother Dr. Agha Saeed has said), from their various backgrounds, and with different notions of destiny , to forge a DOMESTIC agenda based upon common interests , which will serve both the present and future generations. Indigenous Muslims MUST continue to envision and struggle for freedom, justice, and equality through faith and self-determination, and belief in our God and ourselves. We MUST network and work in alliance with others in reclamation of the civil liberties due us, and the human rights according to international law, that we deserve. We MUST be who we were created to be, and act in accordance with prophetic time. When we do, all of humanity benefits. Believe it. Acknowledge it. Get used to it. To paraphrase Shaykh Tawfiq (ra) , "The waters of the red sea are opening. We need to only have the vision, faith, and good sense to go on through". Let's get busy. More on Imam - Hajj Talib' Abdur Rashid head of the Mosque of the Islamic Brotherhood. 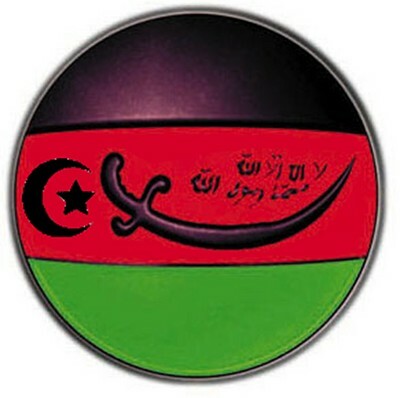 Logo of the Mosque of Islamic Brotherhood, Harlem, complete with shihada and sword. And death in the way of Allah is our promised end. Abdul-Rashid's bio also lists that he is a member of the "N.Y.C. Dept. of Education Chancellor's Interfaith Advisory Committee to the NYC Dept. of Education," pointing to the deeper state of rot in the whole of the DOE when it comes to Islam. That this man is on the KGIA board offers further confirmation of the school's Islamist quality. U.S. Muslims offer support for ensuring a safe and free America The Council on American-Islamic Relations (CAIR) today congratulated President-elect Barack Obama on his election win and offered the Muslim community's support for ensuring that America remains both safe and free. The Muslim Public Affairs Council today sent a letter to President- Elect Barack Obama congratulating him on his victory and on the historic nature of his election as the 44th President of the United States of America. It is a profound testament to the abilities of so many record numbers of Americans to embrace their democratic rights and responsibilities to determine their next leader. We are proud of the record numbers of Muslim American voters who went to the polls to cast their vote and rallied to get their family and friends and communities to get involved and get out to vote. "An important and emotional moment in the history of our nation is unfolding as we speak," said MPAC Executive Director Salam Al-Marayati. "We are proud to live in a place where, as President Obama said tonight, 'all things are possible.' The enormity of these challenges is a shared responsibility of all Americans and we hope that we can work together to face the challenges." We congratulate you on your resounding election as the 44th President of the United States of America. We are proud to live in this powerful historical moment and to have the opportunity to be a part of the crucial work of putting our nation back on course. The immense challenges confronting us all across this country and around the world will require the participation of all Americans. The American people, including Muslim Americans, have placed a great trust in you to lead our country. With this comes the great responsibilities to address issues of national and international affairs. MPAC also congratulated tonight the more than one million projected Muslim American voters, and the legions of volunteers all around the country who put so much energy into registering, educating, and mobilizing people to fulfill their democratic responsibilities. MIM: Background information on MPAC from Discover The Networks. Founded in 1988, the Muslim Public Affairs Council (MPAC) describes itself as "a public service agency working for the civil rights of American Muslims, for the integration of Islam into American pluralism, and for a positive, constructive relationship between American Muslims and their representatives." The organization consists of eight chapters in California, and one each in Texas, Kansas, Nevada, and Iowa. MPAC's vision is "to establish a vibrant Muslim American community that will enrich American society through promoting the Islamic values of Mercy, Justice, Peace, Human Dignity, Freedom, and Equality for all." In an effort to achieve this objective, the Council's mission consists of: "effect[ing] positive change in public opinion and in policy with the purpose of realizing our vision"; "promoting an American Muslim identity"; "fostering an effective grassroots organization"; "training a future generation of men and women who share our vision"; "promoting an accurate portrayal of Islam and Muslims in mass media and popular culture"; "educating the American public, both Muslim and non-Muslim, about Islam"; "building alliances with Muslim and non-Muslims groups"; and "cultivating relationships with opinion- and decision-makers." From its inception, MPAC presented itself as more inclusive, and more open to peaceful coexistence with Jews and Christians, than other Arab and Muslim groups, and sought to make Americans comfortable with Islam by showing how much the religion embraced core American values. Throughout the 1990s, MPAC nurtured this image of moderation by organizing Muslim-Jewish dialogues in Los Angeles. Its members received invitations to the Clinton White House and appointments on federal commissions; they were similarly courted by the Bush campaign as the Clinton presidency drew to a close. MPAC's Senior Advisor, Maher Hathout, who has close ties to the Muslim Brotherhood and espouses the radical brand of Islam known as Wahhabism, was invited to address the Democratic Convention in Los Angeles in 2000. Shortly thereafter, however, MPAC endorsed George W. Bush for U.S. President. MPAC claims that Islam is a religion of peace and moderation, and contends that Muslim extremists are no more numerous or dangerous than fundamentalists in any other faith. "There are radical Christian, Jewish and Hindu movements, too," says MPAC, "which are also capable of slaughtering innocents." On occasion, MPAC has publicly condemned Islamic suicide bombings. These condemnations, however, are invariably accompanied by endorsements of Muslim "resistance" and "armed struggle" which MPAC frames as justified retribution against prior Israeli or Western transgressions. Holding Israel entirely responsible for the "pattern of violence" in the Middle East, MPAC asserts that Hezbollah "could be called a liberation movement." The Council likens Hezbollah members to American "freedom fighters hundreds of years ago whom the British regarded as terrorists." In a November 1997 speech at the University of Pennsylvania, MPAC Co-Founder and Executive Director Salam Al-Marayati steadfastly refused to call Hezbollah a terrorist organization; he justified the existence of Hamas as a political entity and a provider of social programs and "educational operations"; and he equated jihad with the sentiments of the American statesman Patrick Henry, whose "Give me liberty or give me death" declaration was, in Al-Marayati's view, "a way of looking at the term jihad from an American perspective." In a 1999 position paper, MPAC justified Hezbollah's deadly 1983 bombing of the American Marine barracks in Lebanon as a "military operation" rather than a terrorist attack. As Maher Hathout puts it: "Hezbollah is fighting for freedom, an organized army, limiting its operations against military people, this is a legitimate target against occupation. … this is legitimate, this is an American value -- freedom and liberty." According to MPAC: "Israel was established by terrorism"; its founding "involved the unjust and illegal usurpation of Muslim and Christian land and rights"; and "to recognize the legitimacy of that crime is a crime in itself." MPAC characterizes Israel as a "racist, chauvinistic and militaristic" state that is prosecuting "a war to steal land from Palestinians, to decimate their leadership, to humiliate the Palestinian people." Condemning Israel's "apartheid-like ideology," MPAC warns: "History shows that Muslim and Christian religious rights are not safe under Israeli occupation." Israelis are "the worst terrorists in the world," says MPAC, "… Yet Israel is not found on the list of state sponsors of terrorism in the [U.S.] State Department Report on Terrorism." MPAC co-sponsored pro-Palestinian rallies in the fall of 2000, where MPAC speakers chanted "Khaybar, Khaybar, oh Jews, the Army of Muhammed is coming for you!" The rally featured literature and many placards calling for the annihilation of the Jews and Israel. On November 30, 2002, MPAC Vice Chairman Aslam Abdullah said: "Those who are part of the political Zionist movement in America … know it very well that without the support of the United States … their country, namely Israel, would not be able to pursue its apartheid and racist policies in the Middle East. They will use every means possible to ensure that American administration stays on their side. They will create false enemies, they will distort facts, they will manipulate events; and they will concoct and fabricate lies. They have taken America hostage." On March 23, 2005, MPAC National Director Ahmed Younis spoke at a Muslim Students' Association-sponsored event, where he explained that because Adolf Eichmann was himself a Jew, it could accurately be said that Jews had killed themselves in the Holocaust. MPAC speakers regularly complain that the U.S. is "dominated" by Zionists and favors Jews over Muslims. Opposed to efforts to shut down Islamic charities that fund terrorism -- alleging that such efforts interfere with freedom of religion and the exercise of the Muslim obligation to give to charity -- MPAC states that the U.S. government should instead investigate what it terms Jewish "terrorists" like the Jewish Defense League. The Council signed and sponsored a petition to reinstate the assets of Hamas' charitable front, the Holy Land Foundation for Relief and Development, after it was designated as a front for terrorist financing. According to MPAC, "A major threat to the safety of the Muslim community is the Islam-bashing that has been very evident since 9/11. There has been a steady stream of attacks on the Quran … These attacks are vicious, mean-spirited, and politically motivated. … [T]he most sustained and vitriolic [attacks] are from right-wing Christian groups led by Jerry Falwell and Pat Robertson." In a May 7, 2004 statement, MPAC said: "The scandal of Abu Ghraib was not an isolated incident but a manifestation of hate rooted in a distortion of American culture. The soldiers charged for torturing and sexually humiliating Iraqi prisoners were reflecting, among other things, an irrational hatred against Arabs and Muslims. Hatred in Abu Ghraib is inextricably linked with hatred increasingly fostered by some elements of our government, our media, and other major national institutions." After a series of arrests made in connection with an August 2006 airline terror scare in London, President Bush called the uncovered plot "a stark reminder that this nation is at war with Islamic fascists who will use any means to destroy those of us who love freedom, to hurt our nation." MPAC spokeswoman Edina Lekovic reacted, "When the people we need most in the fight against terrorism, American Muslims, feel alienated by the President's characterization of these supposed terrorists, that does more damage than good." In September 2005, MPAC joined with the anti-war organization Code Pink for Peace to sponsor a Culver City, California event promoting a new book by UC-Irvine professor Mark LeVine, who contends that an "Axis of Empathy" is the only strategy that can bring about a long-term solution to the war between radical Islam and the West. MPAC has also worked closely with International ANSWER, which has intimate ties to Ramsey Clark's International Action Center and the Marxist-Leninist Workers World Party. MIM: The Islamic Society of North America (ISNA) an unindicted co -conspirator in the Holy Land Hamas funding trial writes that that see Obama as "an individual with the mental clarity to understand our needs". The Islamic Society of North America (ISNA) takes this opportunity to congratulate Barack Obama on his historic victory in this presidential election. In electing him to office, we as a nation saw in Barack Obama an individual with the mental clarity to understand our needs, the moral character to uphold our principles, and the humility to seek counsel when in doubt. His roots, which stretch from Hawaii to Jakarta, and from Harvard Square, Massachusetts, to Hyde Park, Chicago, will prove invaluable as he goes about serving a nation that is now more than ever, culturally diverse. In so doing we trust that he will seek wise counsel and keep faith with Almighty God. Barack Obama's victory is perhaps greater in that it finally allows America to practice what it for so long has preached to others. It allows America to close the gap that separated its humanitarian ideals from its social ambitions. America has for now, at least, lived up to its promise. And as for the rest of the world, the results of this election give hope to its citizens that this nation may now be willing to extend its lofty principles to include them as well. MIM: Paul Sperry on ISNA's terrorist ties. ISNA is also an unindicted co-conspirator in the Holy Land Foundation Hamas funding trial. WASHINGTON – The California imam who helped convert an al-Qaida suspect to Islam headed a Muslim activist group under investigation here for possible financial ties to terrorist front groups. Muzammil H. Siddiqi, former president of the Islamic Society of North America, ministered to a 25-year-old Muslim convert now the subject of an FBI manhunt. Adam Gadahn allegedly traveled to Pakistan and Afghanistan to train at al-Qaida camps following his conversion while attending the Islamic Society of Orange County in Garden Grove, Calif., in the late 1990s. Siddiqi is head of the mosque there. Congress is reviewing the financial records of the Islamic Society of North America, or ISNA, as part of a post-9-11 investigation into alleged ties between tax-exempt Muslim organizations and terrorist groups. Siddiqi served as president of ISNA from 1996 to 2000. He still serves on its board. ISNA did not return phone calls to its Indianapolis headquarters. The Senate Finance Committee, which is heading the probe, earlier this year asked the IRS for tax records on ISNA – the nation's largest Islamic organization – to determine the source of the non-profit group's funding. Names of donors are redacted from public tax documents for privacy reasons. It's suspected that many U.S.-based Muslim groups receive the bulk of their money from Saudi-based charities tied to al-Qaida and other terrorist groups. Many also have been financially linked to Dallas-based Holy Land Foundation for Relief and Development, the largest Muslim charity in the U.S., which was shut down after 9-11 for ties to the terrorist group Hamas. Its assets have been frozen. ISNA and Holy Land Foundation shared a web portal before authorities raided the offices of the Muslim-owned web hosting company in 2001. In a TV interview, Siddiqi said Gadahn did not discuss any plans to travel to Afghanistan with him when he attended his mosque in 1996 and 1997. "Who knew about al-Qaida at that time?" he said. "We had no idea of anything like that." Siddiqi, who was reared in Pakistani religious politics and studied Islam at a Saudi university, made a public appeal for his former pupil to turn himself in to authorities. Siddiqi held the press conference Thursday after FBI agents questioned him. He told Gadahn he should not get involved with any group that advocates "terrorism." The thin, mild-mannered Siddiqi asserted in an interview that "Islam is the religion of peace." According to "Silent No More: Confronting America's False Images of Islam" – a book on the Council on American-Islamic Relations' recommended reading list – Siddiqi is regarded as "one of the most respected Muslim leaders" in America. In September 2001, President Bush invited him to lead a prayer during the 9-11 memorial at the Washington National Cathedral. He also read from the Quran. ISNA's website says its mission is to "advance the cause of Islam and Muslims in North America." It lists training imams as its No. 1 goal. But critics say ISNA is an extremist group disguised as a moderate group. ISNA "enforces Wahhabi theological writ in the country's 1,200 officially recognized mosques," said terror expert Stephen Schwartz, author of "The Two Faces of Islam: Saudi Fundamentalism and Its Role in Terrorism." Wahhabism, a puritanical, anti-Western strain of Islam, is the official religion of the Saudi government. It's also practiced by Osama bin Laden. Members of ISNA's board include controversial New York imam Siraj Wahaj, named as an unindicted co-conspirator in the federal case last decade against terrorist Omar Abdel Rahman, a.k.a. the Blind Sheikh. Siddiqi and Wahaj spoke at the Islamic Circle of North America's 2001 convention in Cleveland together with Saudi Shaikh Abdur Rahman al-Sudais, senior imam at the Grand Mosque in Mecca, who has been quoted vilifying Jews as the "scum of humanity" and "the grandsons of monkeys and pigs." The three were scheduled to speak again in December at an Islamic conference in Kissimmee, Fla.
Siddiqi, who writes a weekly column for a Pakistani publication, has spoken at pro-Hezbollah and pro-Hamas rallies, and has supported an Islamic state in the U.S., while praising martyrdom for the Islamic cause, according to the SITE Institute, an anti-terror watchdog group. On Oct. 28, 2000, Siddiqi issued a stern warning to America during an anti-Israel rally across from the White House. He and other Islamic leaders had organized the demonstration to protest America's pro-Israel policy and to support what they called just resistance to Israeli occupation of Palestinian territory. "America has to learn," Siddiqi was quoted as saying, "if you remain on the side of injustice, the wrath of God will come. Please, all Americans. Do you remember that?" Then he stressed: "If you continue doing injustice, and tolerate injustice, the wrath of God will come." Abdurahman Alamoudi, the former American Muslim Council president arrested last year on terrorism-related charges, appeared with Siddiqi at the 2000 protest rally. And he proclaimed: "Hear that, Bill Clinton! We are all supporters of Hamas. I wish to add that I am also a supporter of Hezbollah." 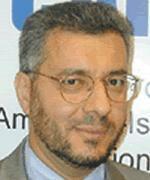 ISNA's secretary-general, Sayyid M. Syeed, is the former director of academic outreach at the International Institute of Islamic Thought, a Northern Virginia think tank raided in 2002 by federal authorities on suspicion of terror-financing. The book "Silent No More" describes Syeed, a native of Kashmir, as a "prominent mainstream Muslim." The FBI fears al-Qaida is recruiting American converts like Gadahn to blend in to American society and not raise security suspicions before carrying out suicide attacks in America. Agents are searching for Gadahn and six other al-Qaida suspects in an attempt to disrupt a possible al-Qaida plot to attack America again this summer. Paul Sperry is Washington bureau chief for WorldNetDaily and author of "Crude Politics." Washington, DC | November 5, 2008 | www.adc.org | The American-Arab Anti-Discrimination Committee (ADC) congratulates President-Elect Barack Obama on his election as the 44th President of the United States of America. ADC also thanks the Arab and Muslim American communities for their engagement, involvement, and historic voter turnout in this election. MIM: The congratulatory message of the Islamic Circle of North America a group tied to Al Qaeda. Islamic Circle of North America (ICNA), the largest grassroots-based Islamic organization of America has congratulated President-elect Barack Obama on his historic electoral victory and becoming the 44th President of the United States of America. MIM: The American Muslim Taskforce published a paen to Obama saying that "our nation has risen to new majestic heights". Washington, D.C. 11/04/08: The American Muslim Taskforce on Civil Rights and Election (AMT***), an umbrella group representing major Muslim organization, has congratulated president-elected Barak Obama at his world-historic victory and pledged their full support for his efforts to build a better world. "Today, as a nation we have given substance to the Declaration of Independence, especially its foundational principle that all men are created equal. Our nation has thus risen to new majestic heights. "Today, America has redeemed itself and the nation has undergone a cultural transformation that has the potential of impacting the whole world. "We applaud the graciousness shown by Sen. John McCain in his concession speech, and we offer our full support and cooperation to president-elect Barak Obama in his efforts to build a better America and a better world." MIM: The American Muslim Association of North America congratulated Obama. American Muslims for Emergency & Relief (AMER) congratulate President- Elect Barack H. Obama on his victory and on the historic nature of his election as the 44th President of the United States of America. We are proud to live in this powerful historical moment and to have the opportunity to be a part of the crucial work of putting our nation back on course. This election was historic in many ways and we know Muslims became actively involved. AMANA & AMER also congratulate the Center for Voter Advocacy, the Arab American Institute Foundation, the millions projected Muslim American voters, and the legions of volunteers all around the country who put so much energy into registering, educating, and mobilizing people to fulfill their democratic responsibilities. guided and obedient to His will. Ameen.